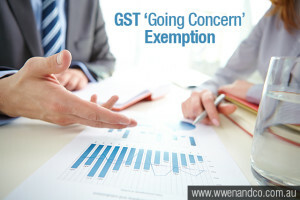 What is the ‘going concern’ GST exemption? Are you eligible for the ‘going concern’ GST exemption? The “Going concern” exemption for GST purposes has been in place for many years. A “going concern” refers to an enterprise’s ability to continue trading, with the sale of that business generally eligible to be GST-free if the enterprise is deemed as such. The GST exemption has its advantages — a purchaser of a business does not have to find extra funds to cover an additional amount to cover GST, which would be added to the agreed purchase price. Further, if they are registered for GST they would typically be entitled to claim an input tax credit, which in some cases cannot happen until some time after the completion of the transaction. The exposure is therefore on the vendor not the purchaser. Some vendors seek to mitigate risk related to the business by including a clause in the sale contract. This requires the purchaser to indemnify the vendor for any GST that may be payable in the event that the Tax Office does not view the transaction to be a supply of a going concern for GST purposes. “the supplier and the recipient have agreed, in writing, that the supply is of a going concern”. The sale of business contract will usually specify that the business being sold (that is, the “supply”) is a going concern when the contracts are exchanged. The vendor is required to supply “all of the things that are necessary” for the continued operation of the enterprise. This does not mean everything that is owned by the business. It does, however, mean those things are necessary for the enterprise to function in the hands of the new owner. Generally, this includes the necessary assets such as premises, plant and equipment, and customer contracts. It may also include arrangements such as ongoing advertising. Working out whether this condition is satisfied can be complex –speak to the chartered accountants at our Epping office for assistance. The legislation requires the vendor to carry on the business “up until the day of sale”, with the business deemed to be transferred on the date on which “effective control and possession” of the business is handed over to the buyer.